As I was looking for something interesting to photograph on my wetland walk, I noticed this paper wasp (Polistes fuscatus) nectaring on swamp milkweed (Asclepias incarnata). It was moving slowly enough – and was focused so strongly on nectar – that it was relatively easy to get some photos of it. In fact, I ended up watching and photographing it for about 10 minutes. A male paper wasp (Polistes fuscatus) feeding on milkweed nectar. You may or may not know that most (all?) 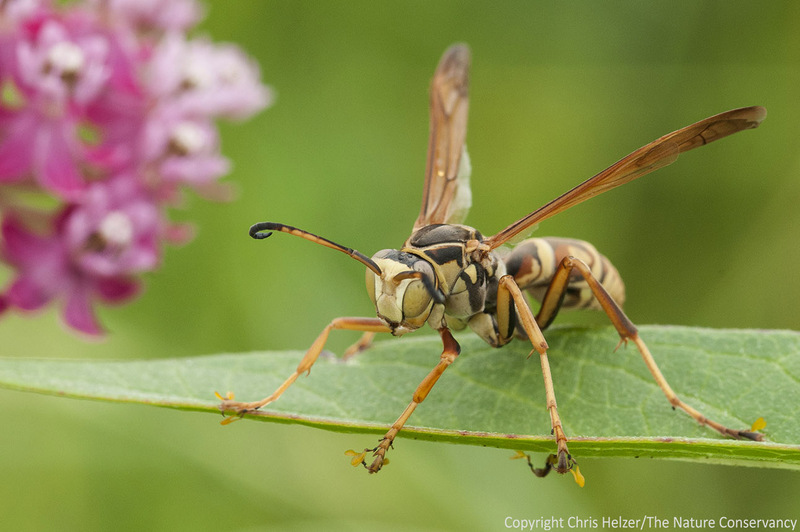 wasps in our prairies feed on nectar as adults, but feed invertebrates to their offspring. Many wasps are parasitoids – they capture and paralyze their prey, stuff it into a burrow or other similar structure, and then lay an egg on it. When the egg hatches, the wasp larva feeds on the paralyzed invertebrate. Most wasp species specialize in capturing a particular kind of invertebrate; some attack spiders, others go after cicadas, bees, flies, etc. Parasitoid wasps tend not to be aggressive toward humans, and are (at least most of them?) solitary – just a single female provisioning food for her nest. The mud dauber is an example of a parasitoid that is often seen in yards. Their mud tubes often show up on the sides of houses or inside garages. 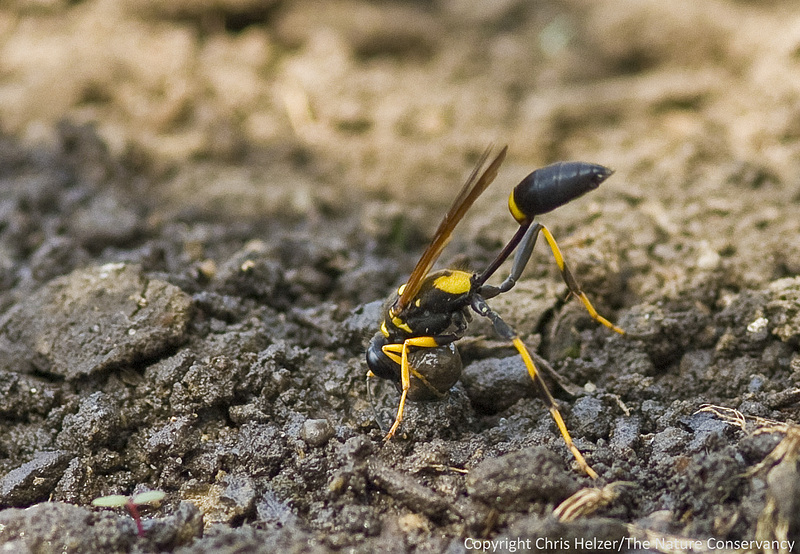 A black and yellow mud dauber wasp creates a ball of mud she’ll use to build her nest – a mud tube – which she’ll then fill with paralyzed spiders and her eggs. A second species of mud dauber (irridescent blue/black) doesn’t make her own nest, but instead opens up the mud tubes of the black and yellow dauber, takes out the original eggs, and replaces them with her own! The paper wasp is a little different. Paper wasps are social, and their familiar hanging nests are initiated each spring by a fertilized queen. Often, the queen will be joined by other females who help build the nest and feed the young. However, any eggs laid by those other females are eaten by the queen, ensuring her dominance. As the nest grows, multiple generations of wasps are produced, some of which become aggressive defenders of the nest – and that’s when the trouble starts for those of us who host paper wasps on our front porches. Another difference between paper wasps and parasitoid wasps is that paper wasps catch and kill their prey (often caterpillars) rather than just paralyzing it. In fact, after they kill a caterpillar, they’ll feed chunks of it to their older larvae and then give prechewed pieces to younger larvae. You can read much more about paper wasps at this wonderful site from the University of Michigan. In addition, here is a link to a short YouTube video with fantastic footage of paper wasps. The same wasp as above, with multiple pollinia attached to its feet. The pollinia are the yellow globs at the tips of its legs. Wasps are common visitors to flowers, but in many cases are less effective pollinators than fuzzy bees that get coated with pollen. However, as I’ve been paying particular attention to bees and other pollinators during the last several weeks, I have seen numerous wasp species on milkweed flowers. That probably works out pretty well for the milkweeds, since all they really need is a creature that steps into multiple flowers as it crawls around. 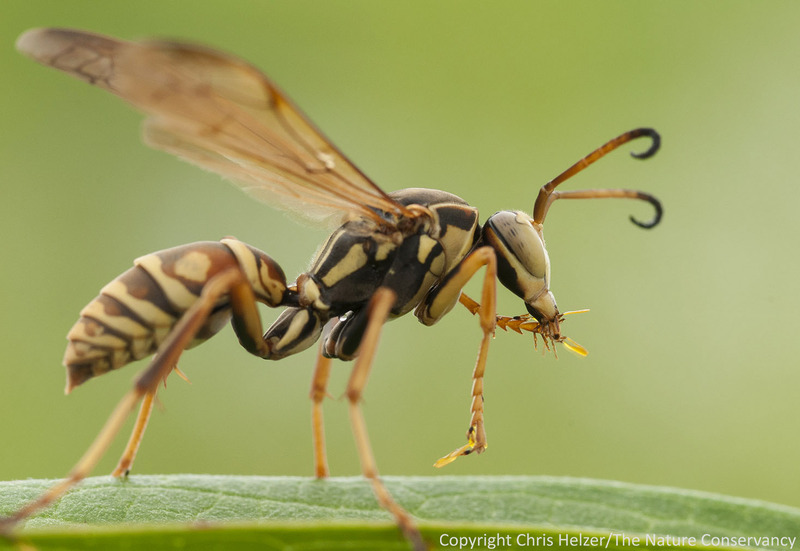 Paper wasps are not among most people’s favorite insects, and for good reason. Many of us have been stung by the aggressive defenders of a paper wasp nest. On the other hand, those stinging wasps are just defending their nest and queen – a noble and virtuous act, and something that’s hard to blame them too much for. Regardless, it’s also nice to see a paper wasp doing something that contributes to the greater good, like pollinating a milkweed plant. When I’m out taking photos of fluffy white milkweed seeds later this fall, I’ll be sure to mentally thank the paper wasp for a job well done. 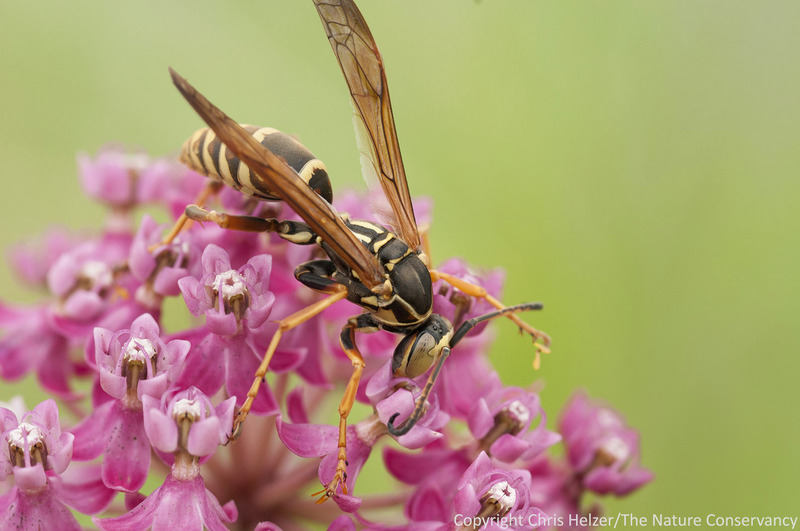 This entry was posted in Prairie Insects, Prairie Natural History, Prairie Photography, Prairie Plants and tagged dauber, milkweed, mud dauber, nectar, paper wasp, photography, polistes fuscatus, pollinating, pollinator, pollinia, sting, swamp milkweed, wasp by Chris Helzer. Bookmark the permalink. Chris – I thought this was really interesting! I do have a question for you or anyone else who knows more about wasps than me (which may be anyone who subscribes to this blog). This year we have been discovering paper wasp nests in our wet prairies….not in trees. This may be a different species, but I have been asking around and no one seems to have a good answer for me. The prairie is slated for a prescribed fire in the fall and I want to make sure that we don’t have something worth the extra work of relocation or further study. No need to worry, Ryan. The mated females overwinter in rock crevices, barns, hollow trees, and will be safe from fire there. Still, many prairie insects do overwinter in stems so it is wise never to burn an entire remnant or well establish reconstruction in its entirety. The paper wasp featured in these photos is a male, as evidenced by the curly tips of his antennae. The good thing about that from a human perspective is that he has no stinger, though a male will put on a good show of fake stinging movements when held between the fingers. It’s fun to amaze kids (of all ages) by “bravely” catching one of these guys and handling it with impunity. If you really want to amaze, you can say that you know it’s a male by its 13-segmented antennae — Females have 12-segmented antennae (and oh yeah, lack the curly-cue apex). I grow several types of kale, and early in the season, the cabbage white caterpillars do a fair bit of damage (effectively controlled by b.t. ), but later in the season, I don’t even need to treat the kale, despite an abundance of cabbage whites, because the wasps aggressively hunt them. They never get aggressive toward me even when I’m picking the kale their foraging in. Chris, here is the wasp story I promised you. My house has leaf guard gutters. These make a perfect place for paper wasps to make nests. I had so many wasps that they started making nests in my mail box and even a car that was parked on my driveway. My wife was afraid of the wasps. She would not get the mail. She was afraid to go outside with all the wasps flying around. Something had to be done. I purchased a wasp trap. Different wasps from a different region must like the attractant. The attractant included with the wasp trap did not attract any wasps. I tried to remove the top of my gutters to spray all the little nests. This resulted in me getting stung. I had put my hand near a nest I did not see. Ouch! I finally decided removing the top of the gutters to spray the nest was too difficult. I found it easier to catch the wasps in a butterfly net and put them in a cup of water. This proved to be successful. Over the course of the summer I was successful in eliminating most of the wasps nesting on my house. My wife was happy, the wasps were gone, and the problem seemed to be solved. The next year there were few wasps. However, there were wall covering droves of Box Elder Bugs. These were worse than all but the most inconvenient nests of wasps. They covered the house like a swarm. Whenever someone entered or left the house the Box Elder bugs flew around and landed on the person. The Box Elder bugs either got stuck in hair or hitched a ride into the house, car, etc. They were everywhere and were really annoying. Meanwhile, I was still on the lookout for wasps. I did not want them to build more nests. I tried following the Paper Wasps to locate their nest. However, the Paper Wasps did not return to their nest. They flew down, grabbed a Box Elder Bug Nymph and starting eating the thing. At this point I started thinking my effort to eliminate the wasps might not have been such a good idea. Maybe the lack of wasps was the cause for the swarm of Box Elder bugs. I kept watching the wasps and they kept eating Box Elder Bug Nymphs. Overtime, the surviving Box Elder bugs retreated back into the cracks and crevices where they had been originally hiding. All along I thought the Box Elder Bugs were hiding in these locations to escape weather extremes. No, they were hiding from the wasps. Within a few weeks the population of Box Elder bugs shrank back to normal. Now I am not so quick to kill my wasps. I’m still not going to let them make a nest in my mailbox, but I will find a place on my property that they can call home. Quick question. Any tips on collecting Penstemon grandiflorus seed? I have a sizable patch that I’m looking to collect seed from for a sand prairie project, but don’t want to risk collecting too early. The pods are dark, but the seed still seems a tad moist. Can I cut the entire stalk and let them finish drying out in a controlled setting if 90% of the pods are dark? I would tend to wait on the Penstemon seed until it’s drier, but I’m saying that based on caution rather than from experience of harvesting earlier and testing viability… With Penstemon, the seed hangs on very well for a long time after it ripens and dries, so I usually just focus on other species and wait on Penstemon until it’s dry enough that there’s no question of maturity. If you try some early and some late, let me know if you see a difference!! In particular, the article quotes a horticulturalist as saying that sunflowers are very resilient and have deep tap roots. I thought the annual sunflowers were fairly shallow rooted, but wasn’t entirely sure whether that was true. Comments? I thought the information in the article was mostly good, but the “established root system” quote is misleading since the sunflowers are annuals. They didn’t establish a root system unti they germinated this spring! They do, however, have a pretty good tap root on them. Probably a translation error between interviewer and interviewee. I think this photo is very interesting. I like to see the wasp close up feeding. However, I am not a fan of wasps the photo is very interesting. I general detest wasps but I really liked this entry. I’ve never rally had a problem with wasps and this article further propels that belief. Its hornets that I’m not friends with. The article is an interesting view of the daily life of wasps. Thank you for your articles. I learn so much!